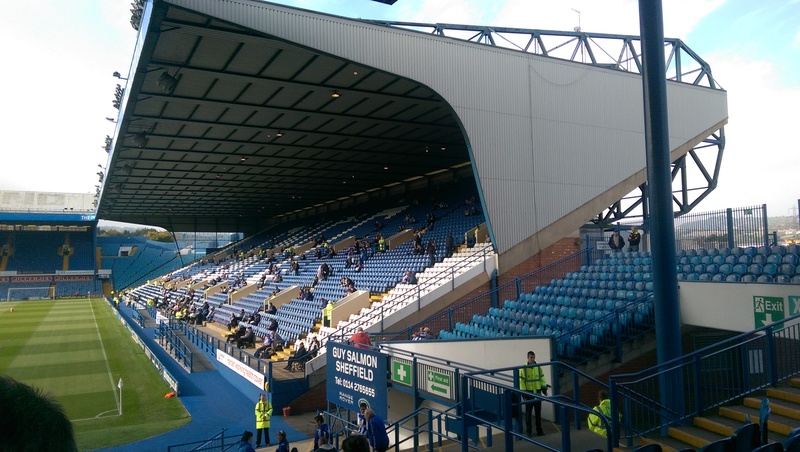 …It’s pretty cramped inside the New Road stand, and I don’t mean that as an insult at all. It feels – for want of a better word – like a proper stand. Once kick-off approaches it seems to teem with humanity, and as me and Nathan stood and chatted over a burger (me) and a hot dog (him) you start to feel like you’re a little bit swept up in a tide of fans, having to lean this way and that to let anyone through. And here comes the only real issue I found with Griffin Park: If you buy some food and want sauce on it, you’ve got to walk about ten metres away from the concession stand to be able to apply condiments, then walk back again. Easy if the place was empty, a bit trickier when it’s so full. Nathan would have more walking to do because at half time he was needed to do an interview with the official Brentford website and media partner, but in the Braemar Road Stand. That involved walking all the way around the ground rather than just nipping across the pitch or around the touchline, then doing the same to get back for the second half. I hoped for his sake that the second period of this game wouldn’t start as quickly as it did at West Brom last week. With about five minutes to go before the game began, I bid my farewells to Nathan and wished him luck for the game. I then found my seat, and found myself in the midst of a lot of chaps – most older than me – who all seemed to know each other pretty well. I guess this is a consequence of buying someone else’s season ticket seat for the day. The first thing I noticed – apart from the lack of elbow room compared to newer stadiums, but you don’t mind being packed in on a cold day – is that the dugouts were right in front of us. 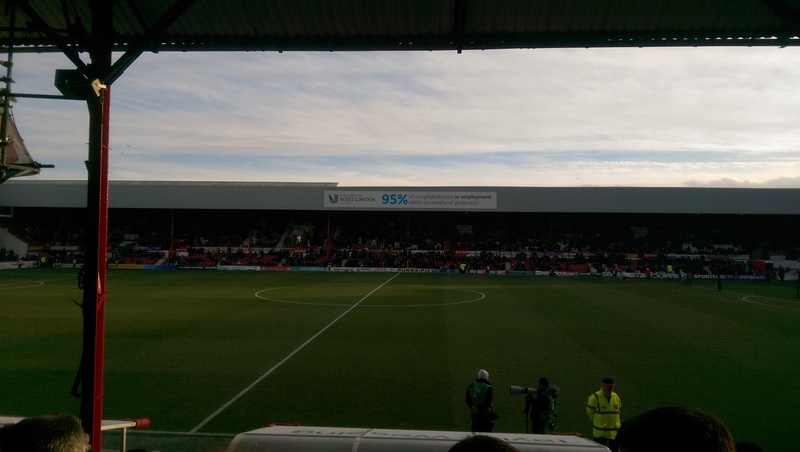 I appreciate that if you sit near the halfway line that you might be near to them, but the nature of Griffin Park being so close to the pitch meant that you really feel like you’re right on top of them. I looked forward to seeing the notably volatile Rotherham boss Steve Evans up close during the game. Most of my favourite football stadiums are in London, where being close to the pitch is more common and space is at a premium. I love Upton Park, White Hart Lane, Brisbane Road, I did love Highbury and now I love Griffin Park. 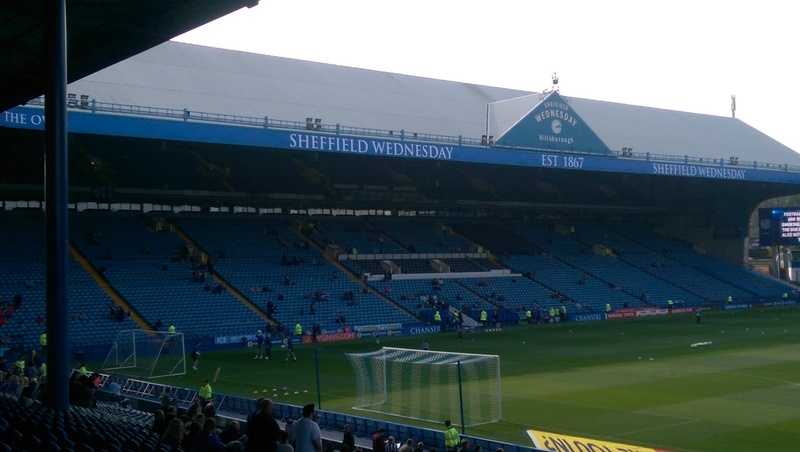 With the place pretty much full it instantly reminded me of watching football as a kid, from the terraced Ealing Road End to the two-tiered standing and sitting Brook Road Stand, where the away fans are put. I’ve since learned that this end is called “The Wendy House” by some fans, and it’s the most accurate nickname I’ve heard for quite some time…. …The Blackpool fans filled about half of the away end, and over the empty seats unfurled a large banner that read “Football First: Financial Fair Play for ALL Clubs, Not Just The Top”. They’re having an awful time of it at the moment, but would loudly back their club throughout the game. 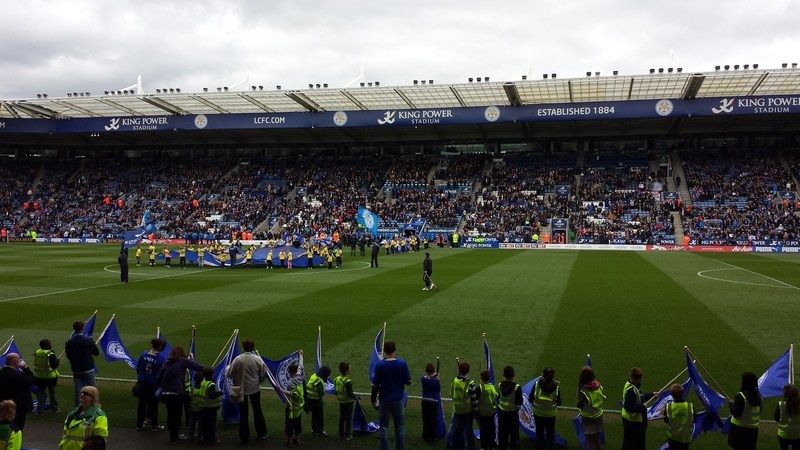 The Rotherham mascot – which I think is a cat – wandered through the stand, hugging fans and having pictures taken. This was pretty cool, rather than just wandering around the pitch and waving at kids he was properly getting involved with older fans and being daft. I suspect there is an out of work actor within that costume, just throwing himself into the role as best as he can. The last two songs played before kick-off are “Two Tribes” by Frankie Goes To Hollywood, which is one of the best songs ever made – as long as you’re listening to the gloriously over the top 12 inch mix of it that lasts for about a day and a half and has Chris Barrie from Red Dwarf doing impressions on it. It really does, look it up. Then they play New York New York by Frank Sinatra. Not the whole song, just the final few bars. And whilst I thought it would be cheesy, it really isn’t. The fans join in, an orchestra swirls beneath the singing and it does make the beginning of a match feel suitably epic. The game kicked off and I noted that Nile Ranger was playing up front for the Tangerines. I’m always one to allow a player to try and play his way out of his reputation, but he spent the entire match leading into every 50-50 ball with his elbows. He got a surprisingly small amount of flak from the Rotherham fans bearing in mind his history, but he wasn’t exactly a terrifying threat up front for Blackpool playing completely on his own. Rotherham made a decent start, with Matt Derbyshire playing alongside on-loan (from Leicester, no less) Tom Lawrence. The latter was making his home début, as was Scott Wooton (from Leeds), Emmanuel Ledesma (Middlesbrough) and Reece James (Manchester United). Rotherham manager Steve Evans has been trying to strengthen his squad as best he can in recent weeks to try and stave off the threat of relegation, with Ledesma the player catching the eye the most, marauding down the right wing with bags of pace and skill. The United fans were excellent, every one of them singing as loud as they could and getting 100% behind the team. 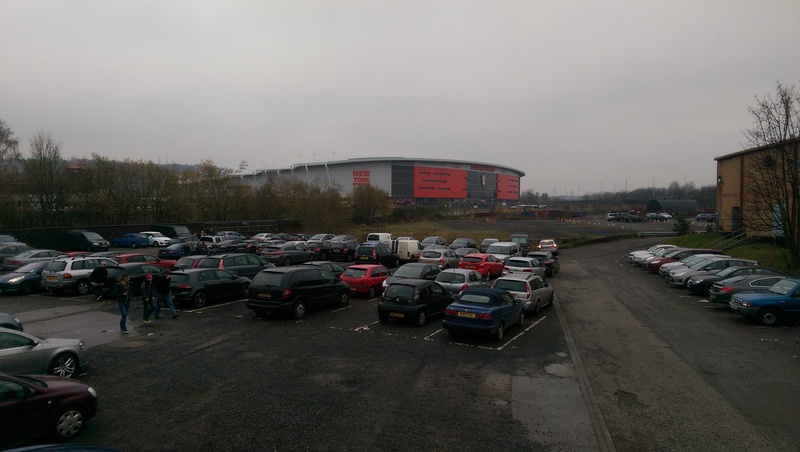 Lawrence had the first really clear-cut chance of the game on 15 minutes, before Nile Ranger had his only really good sight at goal, drawing a decent save out of Rotherham keeper Adam Collin…. …My main footballing memory of Middlesbrough FC harks back to the late 1990s and their fine side that Leicester somehow beat over a replay in the 1997 League Cup final. That team had two of the best players I’ve ever seen play in their starting eleven: The diminutive genius that was Juninho (who still looks like a twelve year old) and the “White Feather” himself, Italian striker and Just For Men refuser Fabrizio Ravanelli. They were terrifying to see in full flight, and the rest of the side wasn’t too bad either, with current Leicester boss Nigel Pearson in their back four. I went to both of those final games. We massively got out of jail in the first game thanks to Emile Heskey (I won’t hear a bad word about that lad. Scored loads for us, made us a load of money and then when we went bust helped out. He’s a proper legend. And the same school year as me, so had him destroy me at Sunday League football as a kid), and then in the replay I popped to the loo and heard a massive cheer as Ravanelli had a goal disallowed. My shoes were splashed. I’d not been to the Riverside since that era though, sat high up in the away end on a very cold winters day. Now was my time to return, with a gig in Scarborough on the Saturday night I had an excuse to go along. 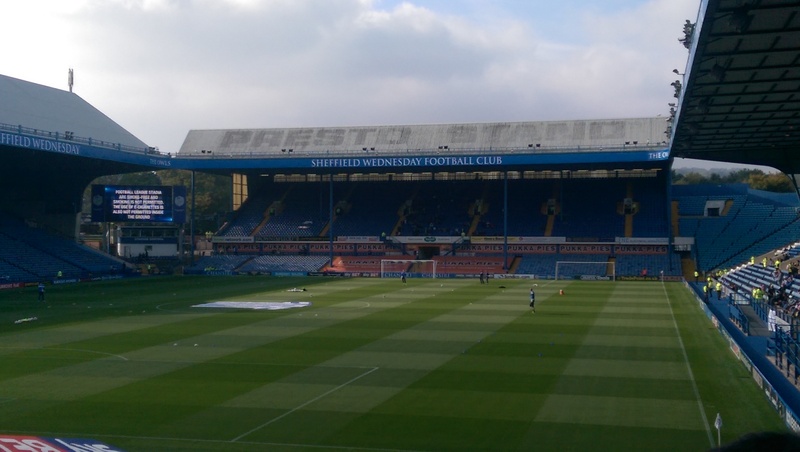 Also, with Brentford as the opponents it would be nice to check out a game with two sides playing good passing football in the Championship. …A wise man once said that rules are meant to be broken. I’d quite like to buy that man a drink right now. No idea who said it first, but whoever it was has given me a very easy opening line for two match reports that contain a contentious subject, if you’ve been following my exploits all season. So yeah, when I started this project I decided that I wouldn’t go and watch my own club all year. I’d focus on going to new places, meeting different fans and enjoying the best game in the world whilst on the road doing my job. And for twenty four games, that’s what I did. Yes, I sneakily watched a League Cup game from the press box earlier in the year but I didn’t write a report on it. But then this past weekend I was in Birmingham and… I just couldn’t help myself. I’m sorry. I really am. Actually, it’s not just as simple as geographic proximity. 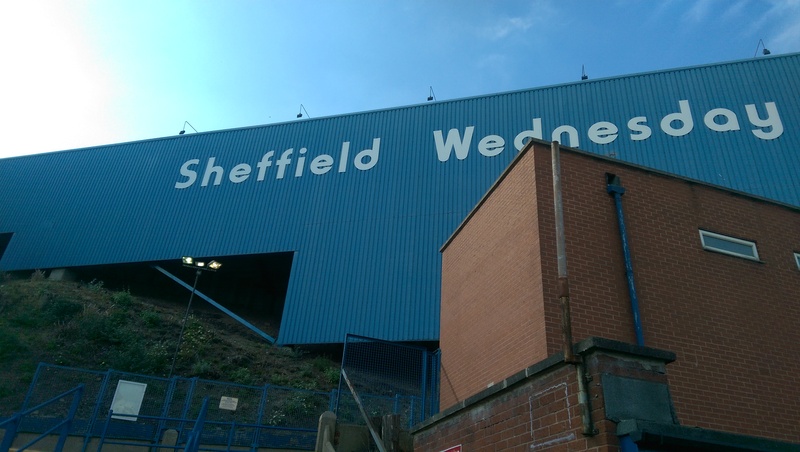 I’m not sure whether regular readers will just understand my desire to watch my own club because they feel a similar love for their own team, or if some people will be genuinely annoyed that I’ve fallen off the proverbial wagon. So let me fill you in on some details that you might have missed during the season. If you want to read the full version of the final two match reports of the season, you can (along with every other game I watched and lots more stuff) by downloading my ebook for less than £2. All sales really help me continue on with my project. Thanks! So I chose Barnsley. 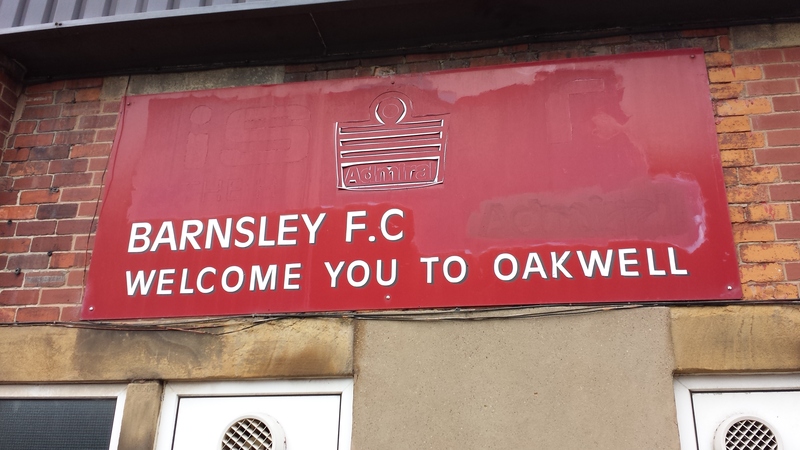 I have been to Oakwell a couple of times before, and have performed in the town just the once. Here are my assorted memories. 1: I must have been about 15 or 16 and we played up there on a Tuesday night. I recall it raining and the old, uncovered away end being the bleakest place in football (it has since been replaced by the away end at Ebbsfleet). My friend got food poisoning from a pie. 2: My second visit I must have been about 20. I went with my Dad. I recall the atmosphere being a little, shall we say, naughty. Leicester fans through things at the innocent and inoffensive Barnsley mascot Toby the Tyke, and after the game many City fans were chased throughout South Yorkshire. Me and my Dad were not. We went back to the car and went to Meadowhall, if I remember correctly. 3: My last visit was for a gig on a Saturday night in a rugby club on the outskirts of town. To get there I drive through the hilariously named Penistone, which I know is pronounced PENNISTONE but I am a child. At the gig was a baby. Everyone noticed the baby. Nobody referenced it. As I went on last, I did the first 15 minutes of my set whilst holding the baby. At the time, I’d not been with my wife for that long and I think this was the point where she realised that I am a little bit odd. The baby only cried when handed back to his Dad. I remember nothing else of the gig. If you liked this little extract, then why not download the full report (and 25 more) buy buying my ebook for Kindle for less than £2? Will really help me carry on my travels AND it’s over 300 pages long and pretty funny. Honest. Ta!